» Is it good for them! Can cats eat bread? Is it good for them! Can cats eat bread? Bread is a staple food in every household and has been the most commonly consumed food in every part of the world. 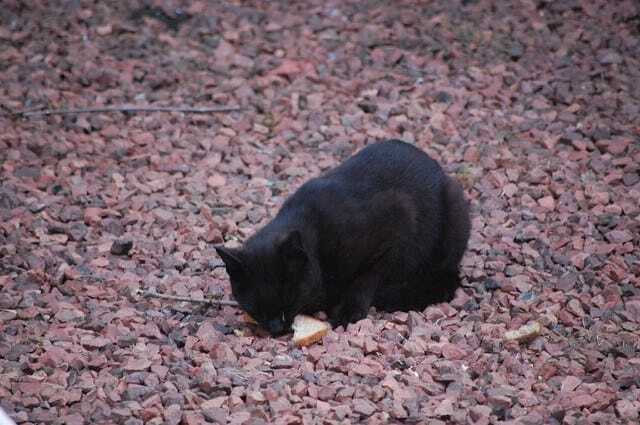 However, can cats eat bread too? Sandwich, toast, muffins, baguette, everyone loves to eat it in any form. Despite being one of the oldest human-made foods, the consumption and demand of this staple food have been consistently high. This is because it is the most versatile food in the world. Moreover, every household makes sure that they never run out of bread in their pantries. Some people like it freshly baked while others like it hard toasted. Many of us like to eat with butter while others prefer to have it with cheese. There are many ways to enjoy it, and there's a myriad of varieties to choose from. It's no wonder that this has been everyone's favorite food since the early times. Breakfast, in particular, isn't complete without a buttered toast or a cheese sandwich. As often as not, you catch your feline friend earnestly staring while you eat your lunch. It’s only reasonable to wonder if your kitty can have some of it as well. 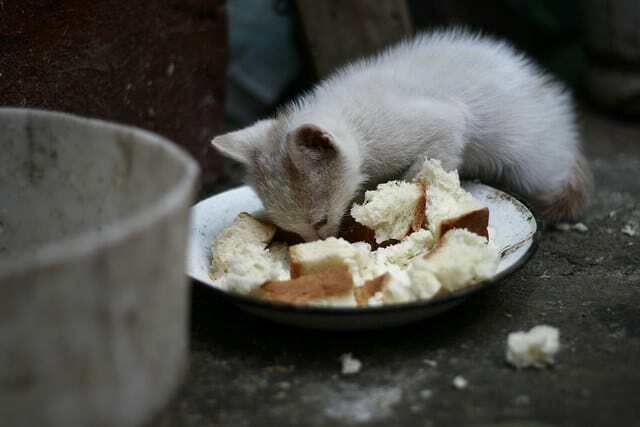 Can cats eat bread as much as we do? Is bread good for cats? Our furry companions probably are very much interested in the foods we usually eat. We can't blame them for that because they are naturally curious creatures. Curiosity is in their genes. As much as we want to spoil our favorite pets with all the things they desire, it’s not wise to compromise their health. Of course, we don’t want to give them something that can endanger their health. We need to be more cautious in feeding our cats. Felines, in general, have more sensitive bodily systems compared to other household pets. As obligate carnivores, their body cannot properly break down and digest foods other than meat. Since it is made from plant-derived flour, a cat’s body may not be able to assimilate and process it when ingested. Does it mean that it is bad for cats? Not entirely. 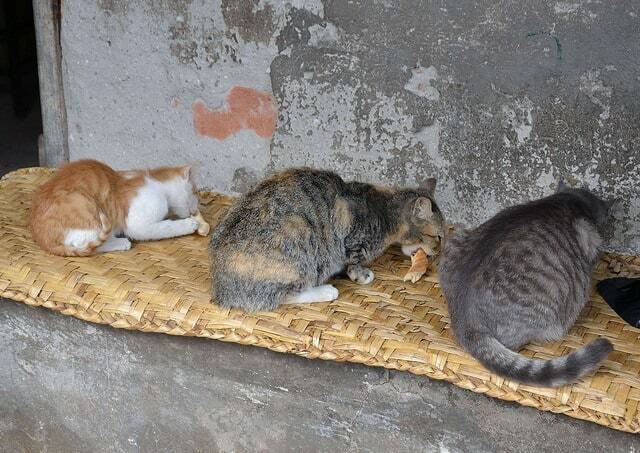 Can cats eat bread then? There's a wide variety of bread, and each of these types makes use of different ingredients and baking techniques. The name ‘bread' itself is a complex term used to describe foods that are produced from a dough of flour and water by baking. Most types of bread commonly contain additives to enhance the taste and extend shelf life. If we’re talking about freshly baked plain variant without any additive, then we can safely say that cats can eat it. However, just like any other plant-based food, there are precautions and restrictions to remember in feeding this staple food to your kitty. There’s no doubt that this is an integral part of a human’s diet. People from different parts of the world have benefited from this prominent food that isn’t only tasty but also nutritious. Can cats eat bread? Let’s dig deeper into the issue to find out the ultimate answer to this question. Is Bread Good for Cats? It has high amounts of sugar and salt. Too many carbs can lead to obesity in cats. Commercial bread mostly contain preservatives. Bread comes in different types, shapes, and sizes. All you need to do is walk into a bakery or a grocery store to see multitudinous varieties of bread available. However, regardless of the type, these starchy foods have certain basic things in common. They are all made grains, usually from the starch of wheat and baked in an oven. It also comes in non-wheat varieties such as rye, corn, barley, oats, and rice. Leavened bread is cultured with yeast or baking soda that causes the dough to rise and produce light, airy product. When mixed with sugar and water, the yeast ferments to create carbon dioxide which allows the dough to rise by filling it with tiny air bubbles. On the other hand, unleavened bread is prepared without any raising agents such as yeast. Pita can also be made without yeast so check the label to know what you’re getting. Just like leavened types, flatbreads may also contain optional ingredients for added flavor such as black pepper, chili powder, diced jalapenos or curry powder. Regardless of the type, this food is usually baked in an oven. However, in some cuisines, they are either steamed or fried. Why is there a need to tackle the different types of bread? This is to show you the complexity of bread, the different types of this staple food and how it is prepared. Understanding all of these things can help us determine which variety is particularly safe for our cats and which are not. Regardless of the type, all pieces of bread are classified as carbohydrates, and most of them include gluten. So the best possible question to ask is whether or not our cats need carbohydrates for their health. 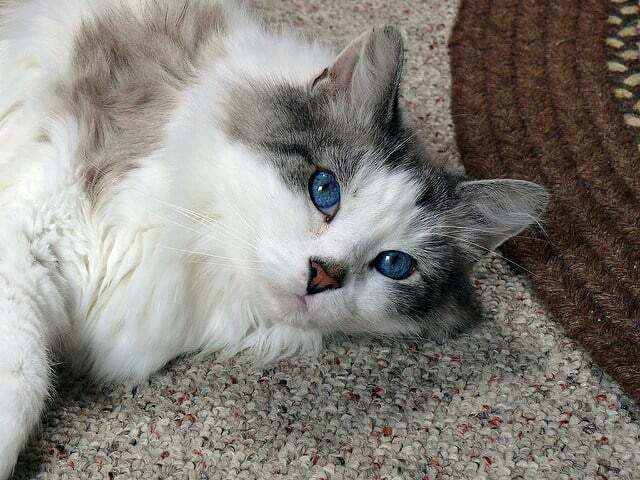 How does carbohydrate affect a feline’s overall health? What about gluten? The truth is, bread is not 100% carbohydrates. It also contains sugar, fat and some traces of protein. It is made from whole grains is an excellent source of fiber, a type of carbohydrate that cannot be digested by the body’s enzymes. Dietary fiber helps with digestion and is best known for its ability to relieve the symptoms of constipation. Aside from carbs and fiber, it is also a good source of niacin and folic acid. Niacin helps lower blood cholesterol while folic acid aids in the production of healthy red blood cells to prevent anemia. Many manufacturers fortify their products with calcium and iron to boost its nutritional value. So, can cats eat bread to get these nutrients? Is this staple food much of a value to felines as it is for humans? We’ll need to look at this food and its nutritional value from a feline’s perspective. Since loaves of bread are high in carbohydrates, you're probably wondering if cats need carbohydrates. As a primary food source, a carbohydrate is a crucial form of energy for most organisms, but not for felines. Cats do not require carbohydrates from their diet because they cannot utilize it effectively. You might be wondering how felines get their energy if they do not consume carbohydrates. Felines are pure meat-eaters, and they acquire all the essential nutrients from their prey's meat. Meat does not contain carbohydrates. However, felines and even canines can convert protein and fat from meat to meet their energy requirements. This means that cats have no use of the carbs in this starchy food. If anything, too much consumption of carbohydrates can expose your kitty to a higher risk of obesity and diabetes. How about gluten? Is there a room for gluten in a feline’s diet? Gluten is a general term for the proteins found in most grains. Some people are sensitive to gluten and are prone to celiac disease. This is a condition in which gluten triggers the immune system to attack the cells of the digestive tract. As a result, people with gluten intolerance may experience abdominal pain, vomiting, diarrhea, and anemia if they consume gluten-rich foods. That also goes the same with felines. Cats can also develop allergies or intolerances to gluten that may cause diarrhea and vomiting. What about dietary fiber then? Fibers also aid digestion in a cat’s tummy the same way it does to humans. It’s easy to assume that cats would require fiber supplement since meat contains none of it. Cats can get fiber requirement from the bones, cartilages, ligaments, and tendons of their prey. Fiber is found mostly in the intestinal tract. 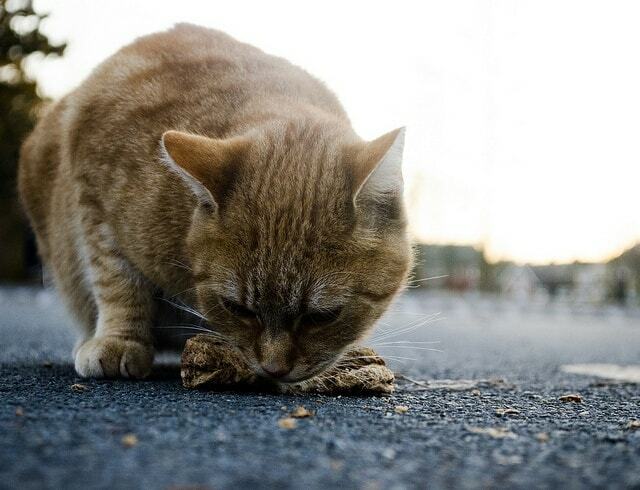 By eating their prey’s intestinal tract, felines also obtain the fiber in it. Plants are not the only source of fiber because carnivores can also obtain it from other animals. To make a long story short, meat is the primary food for felines, and they don't need supplements from other food sources. Can cats eat bread? Yes, they can, but it shouldn't be deemed as their primary source of nutrients. If you're considering feeding it to your kitty, there are certain things that you need to think first. Plain, unseasoned bread should be safe for your feline friend to eat. It becomes dangerous for them if it’s seasoned with different ingredients. Garlic bread, for example, can harm your kitty because garlic is known to be toxic to cats. Avoid variants that are seasoned with onions, chives, leeks, and shallots because these herbs can poison your pet. Raisin bread is also dangerous to felines as raisins can make your feline pet suffer from kidney failure. Grapes and raisins are considered toxic to cats and ingestion of these foods can cause lethargy, vomiting, and diarrhea in cats. How about peanut butter and jelly sandwich? Some cats may be drawn into a peanut butter and jelly sandwich. However, take note that the jelly part is usually made from grapes, which is highly toxic to felines. Another flavoring to watch out is chocolate or caffeine-rich additives. The toxic agent in chocolate, theobromine, can cause tremors, abnormal heart rate, seizures, and death in cats. Some products also contain macadamia nuts, and you may want to stay away from these. Macadamia nuts can be toxic to cats as they are to dogs. If ingested in large quantities, it can cause gastrointestinal distress, tremors, and swollen limbs. It is therefore wise to avoid giving these types of bread to your furry friend. If you intend to share some flatbreads with your kitty, choose the ones that have no spicy seasonings. 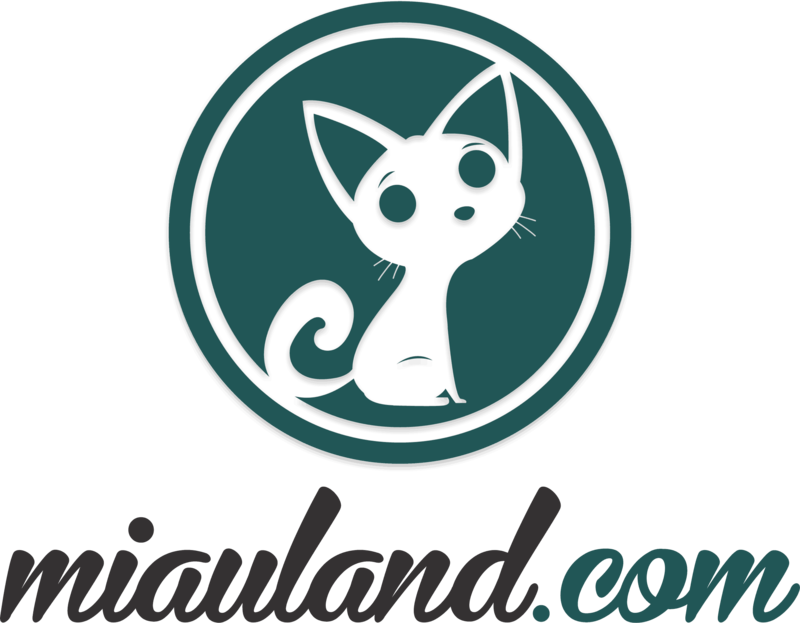 Chili powders, black peppers, and other spices contain a toxic substance called glycoalkaloid solanine that causes gastrointestinal distress in cats. Always give plain bread to your pet and avoid those with too many additives and fillings. Plain bread alone is not toxic to cats. However, it doesn't mean that it's safe to let them eat as much as they want. We need to accept that this staple food has no nutritional value to felines. Moreover, it should not become a significant part of their diet. Can cats eat bread? They can eat it only as an occasional treat and in small quantity. You can break off a small piece of it if your cat pleads for it, but you shouldn't give it more than that. Consumption of yeast can cause your kitty’s stomach to expand after ingestion, causing intestinal obstruction. This obstruction can lead to dangerous bloating and gastrointestinal problems. However, that's not all. The yeast can ferment sugars in the stomach to produce ethanol, an alcohol that can potentially cause poisoning. All these adverse effects are enough reasons to keep your feline pet from ingesting yeast. Does it mean that leavened loaves of bread are dangerous to cats? The yeast used in bread immediately ferments when mixed with sugar and water. Also, it expands to its fullest when exposed to a high temperature through baking or steaming. Therefore, fully-baked leavened loaves of bread are safe for cats to eat because the yeast has already expanded and fermented. However, it becomes a problem when your kitty accidentally swallows uncooked dough or when it has eaten half-cooked bread. If you notice your pet drooling, staggering and lethargic after ingesting uncooked dough, bring it to the vet right away. The yeast may stretch their abdomen to a life-threatening level, and the condition may require immediate medical treatment. Now that you already know the pros and cons of feeding bread to your furball, you’re probably having second thoughts about it. As long as it is plain and fully-baked, there's nothing to be worried about. Moreover, as long as you keep these crucial reminders in mind, you can let your pet enjoy some tasty bread once in a while. Sugar and salt are not toxic to cats. However, felines don't require sugar because they cannot digest it. Too much sugar intake can lead to obesity and diabetes in felines as well as tooth decay. Cats are getting their daily dose of salt from their regular food of meat without the need of other supplements. Large amounts of salt can cause excessive thirst and urination in cats. In worst cases, it can also lead to sodium ion poisoning. A chubby cat may look cuddly and cute, but there's more dangerous to it than what meets the eye. Nowadays, carbohydrate is often pointed out as the main culprit for obesity. 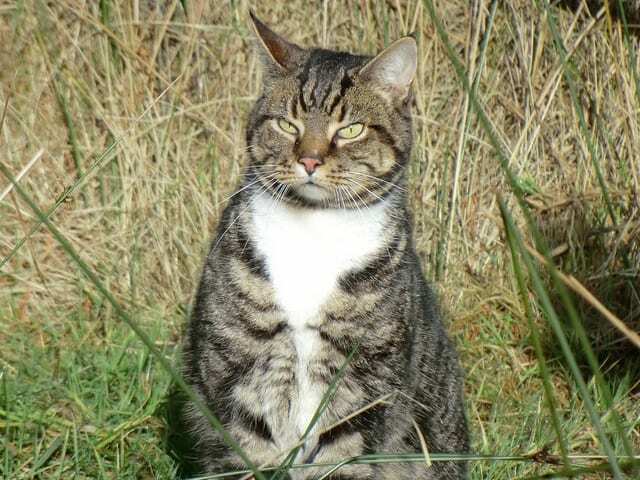 Since felines cannot properly metabolize carbohydrates, it is eventually transformed into fat, hence, the added weight. Preservatives in foods can cause thiamine deficiency in cats. Both cats and dogs rely on dietary thiamine from the meat they eat to maintain their health. Thiamine deficiency may lead to severe acute illness which can be fatal if left untreated. Symptoms of this condition may include anorexia, lethargy, vomiting, convulsions and acute cardiac failure. Due to their delicate teeth and throat, kittens should only be given soft foods that are easier to chew and swallow. Bread is considered dry food and it's better to avoid dry foods from kittens as much as possible. 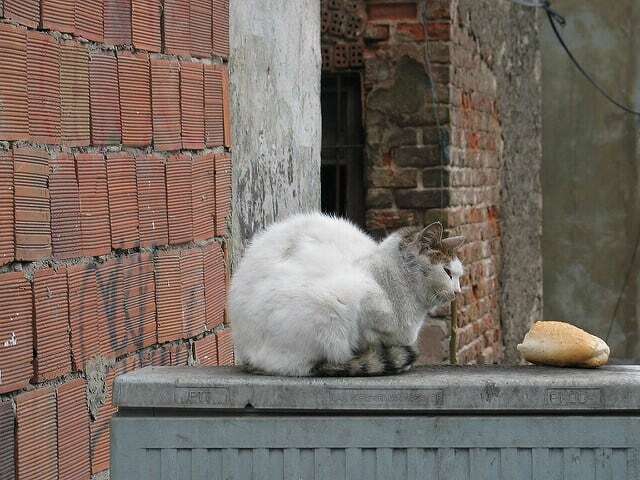 Besides, their developing digestive system is not yet ready to break down bread as adult cats do. Instead of this high-carb food, give them some ground beef or ground chicken to eat when they reach about 4 – 5 weeks of age. Your kitty can eat everyday, unseasoned, fully-baked bread without any ill issues. However, it should be given in small quantities and moderation. For carnivorous animals such as felines, giving them plant-based foods proves to be a pointless idea. However, if they ever show interest in other foods such as bread, it will be up to you to choose the right kind of bread that is safe for them in minimal consumption. The bottom line is: a small amount of plain bread is safe for cats, but it's not recommended. A food rich in carbs, sugar, and salt is not something you should give to your feline pet. If you want your furry companion to attain optimal health, focus on the foods and nutrients that are appropriate for felines. So as much as possible, please stay away from inappropriate foods that may expose them to potential risks.